COMMENTS:        This trigger occurred at longitude,latitude = 168.07,-19.79 [deg]. COMMENTS:        NOTE: This BAT event is temporally(0.0<100sec) coincident with the FERMI_GBM event (trignum=502096303). COMMENTS:        NOTE: This GBM event is temporally(0.0<100sec) coincident with the SWIFT_BAT event (trignum=724438). COMMENTS:        This trigger occurred at longitude,latitude = 212.92,24.63 [deg]. Dec(J2000) = +32d 07' 30"
with an uncertainty of 3 arcmin (radius, 90% containment, including systematic uncertainty). The BAT light curve shows multiple peaks with a duration of about 50 sec. The peak count rate was ~4400 counts/sec (15-350 keV), at ~0 sec after the trigger. Dec(J2000) = +32d 08' 08.7"
with an uncertainty of 3.6 arcseconds (radius, 90% containment). This location is 116 arcseconds from the BAT onboard position, within the BAT error circle. This position may be improved as more data are received; the latest position is available at http://www.swift.ac.uk/sper. A power-law fit to a spectrum formed from promptly downlinked event data gives a column density in excess of the Galactic value (2.50 x 10^21 cm^-2, Willingale et al. 2013), with an excess column of 2.5 (+2.84/-2.37) x 10^21 cm^-2 (90% confidence). UVOT took a finding chart exposure of 150 seconds with the White filter starting 86 seconds after the BAT trigger. No credible afterglow candidate has been found in the initial data products. The 2.7'x2.7' sub-image does not cover the XRT error circle. The 8'x8' region for the list of sources generated on-board covers 100% of the XRT error circle. The list of sources is typically complete to about 18 mag. No correction has been made for the expected extinction corresponding to E(B-V) of 0.21. Dec (J2000): +32d 08' 05.6"
We have analysed 7.8 ks of XRT data for GRB 161129A (Kocevski et al. GCN Circ. 20210), from 90 s to 17.8 ks after the BAT trigger. The data are entirely in Photon Counting (PC) mode. The enhanced XRT position for this burst was given by Beardmore et al. (GCN Circ. 20211). The late-time light curve (from T0+3.9 ks) can be modelled with a power-law decay with a decay index of alpha=2.21 (+0.15, -0.14). A spectrum formed from the PC mode data can be fitted with an absorbed power-law with a photon spectral index of 1.74 (+0.13, -0.12). The best-fitting absorption column is 3.2 (+0.7, -0.6) x 10^21 cm^-2, in excess of the Galactic value of 2.5 x 10^21 cm^-2 (Willingale et al. 2013). The counts to observed (unabsorbed) 0.3-10 keV flux conversion factor deduced from this spectrum is 4.4 x 10^-11 (5.8 x 10^-11) erg cm^-2 count^-1. If the light curve continues to decay with a power-law decay index of 2.21, the count rate at T+24 hours will be 7.1 x 10^-4 count s^-1, corresponding to an observed (unabsorbed) 0.3-10 keV flux of 3.1 x 10^-14 (4.1 x 10^-14) erg cm^-2 s^-1. The results of the XRT-team automatic analysis are available at http://www.swift.ac.uk/xrt_products/00724438. Kindly find the attachment of detection of GRB161129A by Astrosat CZTI. Analysis of AstroSat CZTI data showed clear detection of GRB161129A (Swift BAT detection: S. Barthelmy et al., GCN Circ. 20210) in the 40-200 keV energy range. The light curve shows multiple peak structure at 07:12:06.0 UT, after 27 secs of the Swift Trigger. The measured peak count rate is 170.205 counts/sec above the background in combined data of four quadrants, with a total of 2160.0 counts. The local mean background count rate was 377.79 counts/sec. Using cumulative rates, we measure a T90 of 34.06 secs. We imaged the field of GRB 161129A (Kocevski et al., GCN 20210) with the Tautenburg Schmidt telescope equipped with the prime focus CCD camera. Observations were performed at a midtime of 16:41 UT (November 29). Inside the enhanced XRT error circle (radius 1.7 arcsec; Beardmore et al., GCN 20211) we find a faint source at coordinates RA, Decl. (J2000) = 21:04:54.53, 32:08:05.9 (+/- 0.5 arcsec). Using the USNO B2 star at coordinates RA, Decl. (J2000) = 21:04:54.65, 32:08:05.6 as a photometric reference (Ic = 18.38), we measure for this source a preliminary (Vega) magnitude of Ic = 20.3 +/- 0.2 mag. We note, however, that the DSS2 red shows a faint source at the central position of the enhanced XRT error circle at roughly the same coordinates. Given that the seeing in our images is about 2 arcsec, and given that our images are not substantially deeper than the DSS2 red, we cannot decide whether we see this faint source or a faint transient on top of it. In any case, at the time of our observations any optical transient was fainter than about Ic=20. The Swift/UVOT began settled observations of the field of GRB 161129A 86 s after the BAT trigger (Kocevski et al., GCN Circ. 20210). A source consistent with the XRT position (Beardmore et al. GCN Circ. 20211) is detected in the initial UVOT exposures. There are low-significance signs of the source in all other filters. Though the source seems to reach peak brightness around 500s the photometric errors are also consistent with a constant source brightness up to 10ks. The magnitudes in the table are not corrected for the Galactic extinction due to the reddening of E(B-V) = 0.21 in the direction of the burst (Schlegel et al. 1998). We observed the field of GRB 161129A (Kocevski et al., GCNC 20210) with the optical three color (g', Rc and Ic) CCD camera attached to the MITSuME 50cm telescope of Okayama Astrophysical Observatory. The observation started on 2016-11-29 08:54:33 UT (~1.7 h after the burst). We detected the previously reported source (Mazaeva et al., GCNC 20215; Klose and Stecklum, GCNC 20216) in Rc and Ic bands. Photometric results and three sigma upper limit of the OT are listed below. We used GSC2.3 catalog for flux calibration. "At 07:11:39.96 UT on the 29th of November 2016, the Fermi Gamma-Ray Burst Monitor triggered and located GRB 161129A (trigger 502096303/161129300), which was also detected by Swift (Kocevski et al., GCN 20210). The GBM on-ground location is consistent with the Swift position. The angle from the Fermi LAT boresight is 87 degrees using the Swift position. The GBM light curve shows a bright burst, with multiple peaks over a duration (T90) of about 36 s (50-300 keV). The time-averaged spectrum from T0+4.8 s to T0+45.7 s is best fit by a power law function with an exponential high-energy cutoff. The power law index is -1.13 +/- 0.06 and the cutoff energy, parameterized as Epeak, is 197 +/- 21 keV. The event fluence (10-1000 keV) in this time interval is (8.4 +/- 0.4)E-06 erg/cm^2. The 1-sec peak photon flux measured starting from T0+26 s in the 10-1000 keV band is 5.6 +/- 0.3 ph/s/cm^2. Dec(J2000) = +32d 08' 11.9"
with an uncertainty of 1.8 arcmin, (radius, sys+stat, 90% containment). The partial coding was 69%. The mask-weighted light curve shows a short spike from ~T0 to ~T+0.2 s, followed by several overlapping pulses that last until ~T+45 s. T90 (15-350 keV) is 35.53 +- 2.09 sec (estimated error including systematics). The time-averaged spectrum from T+0.06 to T+44.58 sec is best fit by a simple power-law model. The power law index of the time-averaged spectrum is 1.57 +- 0.06. The fluence in the 15-150 keV band is 3.6 +- 0.1 x 10^-6 erg/cm2. The 1-sec peak photon flux measured from T+26.64 sec in the 15-150 keV band is 3.4 +- 0.2 ph/cm2/sec. All the quoted errors are at the 90% confidence level. Because the light curve seems to resemble that of a short GRB with extended emission (Norris et al. 2010), we perform further analysis of the short spike. Using a 4-ms binned light curve, the lag analysis finds a lag of 4 +/- 3 ms for the 50-100 keV to 15-25 keV band, which is consistent with that of a short GRB. However, the spectral fit of the short spike using a simple power-law model gives a power-law index of 1.9 +/- 0.3. This value is on the softer end of short GRBs, and also softer than all the initial pulses of those short GRBs with extended emission (Lien et al. 2016). The power-law index of the spectrum for the rest of the light curve is 1.53 +/- 0.06, which is harder than the initial spike and thus unexpected from a short GRB with extended emission. We observed the field of GRB 161129A (Kocevski et al., GCNC 20210) in Ks-band with a wide-field NIR camera at Okayama Astrophysical Observatory (Japan). The camera has an effective aperture of 0.91m. Observations started from 08:44 UT on 29th November, 93 min after the BAT trigger, to 09:29 UT. The total exposure of 17.3 min was successfully obtained. close to the position reported by Beardmore et al. (GCNC 20211), and Klose & Stecklum (GCNC 20216). We measured the source magnitude of Ks = 15.95 +/- 0.14 (Vega). The calibration was made against 2MASS field stars. detection of this GRB happened on the tail of a big Solar Flare. with a duration (T90) of 41.5 s measured from T0+3.75 s.
calculated energy range of about 80 =E2=80=93 500 keV. modules is also consistent with this incident geometry. polarimetric measurement of this burst can be attempted. We observed the field of GRB 161129A (Kocevski et al. GCN 20210) with=E3=80=80the 1.05-m Schmidt telescope and KWFC (Sako et al. 2012, Proc. SPIE=E3=80=808446, 84466L) at Kiso Observatory in Japan. The observations were made=E3=80=80in z-band at 2016-11-29 08:15-08:36 (UT; about 1 hour after the burst). The flux is calibrated with z-band imaging data for a nearby SDSS field taken at almost the same airmass as that of the GRB field. We do not detect any new source within the XRT error circle or at the position with Swift/UVOT and other telescopes' detections (e.g., Kuin et al. GCN 20217) and the upper limits are as follows. We observed the optical counterpart of GRB 161129A (Kocevski et al., GCN 20210; Mazaeva et al., GCN 20215) with the Nordic Optical Telescope (NOT) equipped with the AlFOSC imager. Observations were carried out in the R band (3x200 s), with a mid time 2016 Dec 4.83 UT (5.6 days after the GRB). Observing conditions were good with a seeing of 0.8". Given their small separation (1.4"), these objects may be blended in images with coarser spatial resolution. Source A (with a magnitude R = 21.6) is consistent in flux and position with the faint smudge visible in the DSS red, previously noted by Mazaeva et al. 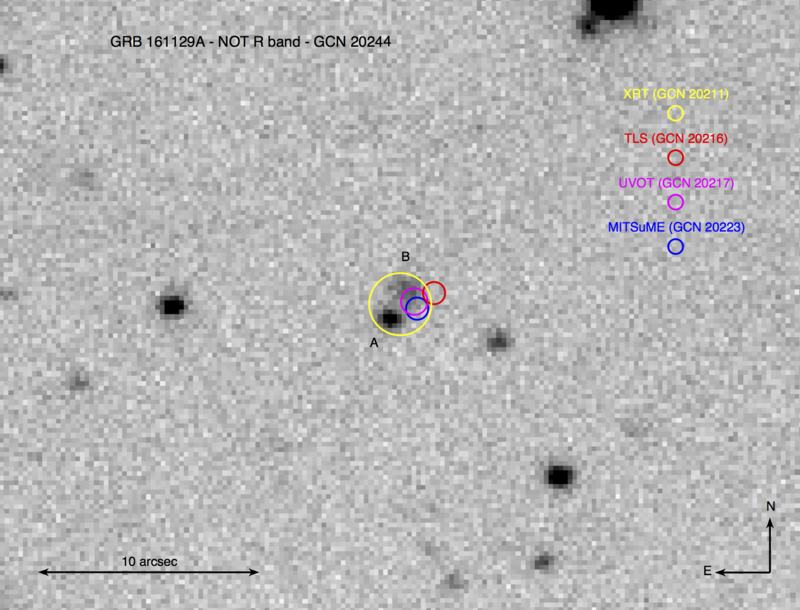 (GCN 20215) and Klose & Stecklum (GCN 20216). Source B is extended, and is consistent with the position reported for the optical afterglow by Kuin et al. (GCN 20217) and Kuroda et al. (GCN 20218). We propose that source B is (dominated by) the host galaxy of GRB 161129A. We further note that the cumulative magnitude of the complex (objects A+B) is R ~ 21.2, which is significantly fainter than previous reports (e.g. Kuroda et al., GCN 20218; Mazaeva et al., GCN 20224), thus firmly establishing the presence of a fading optical afterglow for GRB 161129A. Photometry was computed against the values of the two USNO-B1.0 stars as listed by Mazaeva et al. (GCN 20215). We observed the field of GRB 161129A (Kocevski et al., GCN Circ. 20210) with OSIRIS on the 10.4 m GTC telescope on La Palma (Spain). The observations started at 19:46:40.9 UT on 05-December-2016 (6.52 days after the burst), which consisted of 4 x 1200 s spectra using grism R1000B, which covers the wavelength range 3700-7800 angstroms, with a resolution of R~1000. Within the enhanced XRT error region (Beardmore et al. 2016, GCN Circ. 20211) we note the presence of sources A & B detected by Heintz et al. (GCN Circ. 20244). The spectrum of the extended object (source B) shows a continuum with a strong emission line that we attribute to the [OII] 3727/3729 doublet at z=3D0.645, as well as weaker emission lines consistent with being H-gamma and H-delta at the same redshift. We propose this star-forming galaxy to be the host of GRB 161129A. The spectrum of source A displays absorption features of Ca II K and H, Mg I and MgH at z~0, confirming it is a foreground star and not related to GRB 161129A. The AMI Large Array robotically triggered on the Swift alert for GRB 161129A (Kocevski et al., GCN 20210) as part of the 4pisky program, and subsequent follow up observations were obtained up to 10 days post-burst. Our observations at 15 GHz on 2016 Nov 29.50, Nov 30.72, Dec 02.69 and Dec 06.68 (UT) do not reveal any radio source at the XRT location (Beardmore et al., GCN 20211), with 3sigma upper limits of 120 uJy, 102 uJy, 90 uJy and 117 uJy respectively.